The United States Anti-Doping Agency (USADA) announced today that Nathan Piasecki of Aurora, Ill., a 25-year-old athlete in the sport of wrestling, received a two-year suspension for a doping violation. 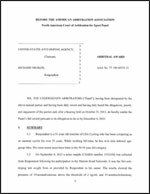 The period of ineligibility was determined by an arbitrator following a hearing before the American Arbitration Association (AAA)/North American Court of Arbitration for Sport (CAS). A sample collected from Piasecki January 10, 2007 as part of the USADA Out-of-Competition Testing Program tested positive for 6alpha-hydroxyandrostendione, which is a metabolite of a prohibited substance under the rules of the Federation Internationale de Luttes Associees (FILA), the international governing body for wrestling, and USADA, both of which have adopted the World Anti-Doping Agency’s Prohibited List. Piasecki established that his positive test resulted from the use of an over-the-counter supplement, 6-OXO, which is produced by a company known as Ergopharm. 6-OXO is an anti-estrogenic agent and an anabolic steroid marketed around the world and over the Internet as a nutritional supplement. Both anti-estrogenic agents and steroids are prohibited under the rules of Olympic sport because they are performance-enhancing and potentially unsafe for use. Piasecki has volunteered to assist USADA with the education of athletes concerning the use of performance-enhancing drugs. Piasecki’s two-year suspension begins February 8, 2007, the date he began serving a provisional suspension. Since Piasecki did not compete between the date the specimen was collected and the date his provisional suspension began, there are no competitive results to be disqualified. USA Wrestling, the national governing body for the sport in the United States, will carry out the sanction.